For most South Bay residents, Monday morning means heading off to a cubicle, a computer and a commute. But for others, the workday brings less regularity and greater risk. From scouring the bottom of the ocean to battling flames on rooftops, the following four professions are some of the riskiest jobs in the South Bay. We found out how those who ply these trades keep themselves out of harm’s way. Southern California is home to the two busiest ports in North America—the Port of Los Angeles and the Port of Long Beach. And everything that moves through these bustling ports—from ship, rail or truck—is moved by a longshoreman. To say that being a longshoreman is strenuous is an understatement. It regularly includes lashing and unlashing heavy steel bars and turnbuckles that secure containers to a ship’s deck, moving around huge loads of cargo with cranes and trucks, and working in all types of weather. Mario Medina knows how hard and risky the job can be. As a night business agent with the International Longshore and Warehouse Union Local 13, he is the first person that gets the call when someone is injured or when an accident occurs. Heavy lifting and bumpy driving mean back injuries are common, as are muscle strains, sprains and broken bones. Recently, the driver of a utility tractor rig, a type of vehicle that moves containers around the terminal yard, broke his leg after a collision ripped the cab off his rig. Then there are the fatalities, something Medina knows intimately. In 1995, his father, who was also a longshoreman, was killed on the job. “He was working on a train, and at that time, there were no regular safety regulations for how they worked on trains. It came into the station, he was knocked down, and it hit him” says Medina. Following his father’s death, the Pacific Coast Marine Safety Code, the handbook of safety and regulations for all dock work, was upgraded; the entire section 17, which deals with rail work, had to be rewritten. However, it can often take an extreme accident to know just what rules need altering. When a 40-foot, 8-ton shipping container fell and killed a longshoreman at the Port of Long Beach last year the regulations surrounding the proper unloading of offshore containers were overhauled. Preventing the big accidents is the goal, but for the day-to-day grind, longshoremen equip themselves with personal protective equipment like hardhats, steel-toed shoes, and safety vests. Still, even the most adept can succumb to accidents. About ten years ago, Medina climbed into the opening of a shipping container loaded with steel. While he was down in the hatch, the load shifted and about 8,000 pounds of steel fell on his right foot, breaking every bone. He was out of work for six months and now has five pins and a screw in his foot. “Everything you do, you’re more alert now,” says Medina of incurring an injury. Working at the busiest port in the country doesn’t exactly make things easier. The sheer volume at the Port of LA necessitates a rapid pace of transfer and a high number of man-hours. But since most longshoremen have had an injury or been on a terminal when an injury has occurred, they are attuned to the inherit risk. “It’s always a matter of balancing safety with tonnage,” says Medina. 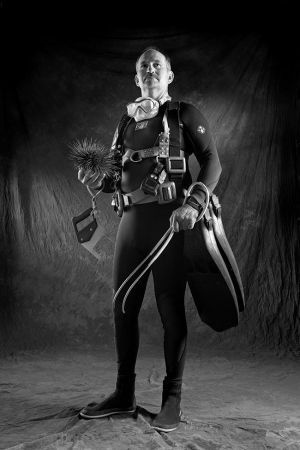 When Jon Wirsing came to Southern California to get his commercial diving certification over 20 years ago, it was the Wild West of the urchin fishery. “At that time, anyone with 50 bucks could get a license to get sea urchin,” says the Redondo Beach-based diver. People that couldn’t find jobs elsewhere headed to the blue waters of SoCal, where the kelp beds were rife with sea urchin feeding on seaweed. The fishery had been thriving since the 1970s, when demand from Japan moved urchin from an underwater nuisance to the sought-after delicacy sold as uni in sushi restaurants. Supplies have since dropped, making it a cutthroat business. Divers keep their best spots secret and their distribution networks close. California no longer issues commercial licenses, so old-timers hold on to theirs in the hopes of selling it off as a ticket to retirement. But the job is not for the faint of heart. As anyone who has watched Deadliest Catch knows, commercial fishing regularly ranks as the most dangerous job in America; the diving aspect throws on another layer of risk. “There are the hazards of going down into deep water, the decompression. It’s been the most hazardous of any work I’ve done,” says Wirsing, who has also been a contract diver for oil companies. Divers face the potential for capsizing, shark attacks and drowning. In addition, whenever you combine income with fishing, people are compelled to go out in hazardous conditions, in inclement weather, or to places they know they shouldn’t, all for the lure of a big haul. Another friend suffered from a “CNS hit”—decompression illness affecting his brain—and had to have a helicopter rescue him at a dive site. Because Torrance Memorial Medical Center is the base station for Catalina Island, they receive many dive-related calls, says Michael Baker, MD, a Torrance Memorial Medical Center Emergency Room physician. Although physicians on staff are able to treat many dive-related injuries, serious problems like decompression, CO poisoning, or air emboli, need to be treated with a decompression chamber like the one on Catalina Island. Wirsing has had a few narrow escapes. Years ago, he was diving off someone else’s boat with four other people. Someone accidentally disconnected his hose, forcing him to do a rapid ascent in extremely deep water, a move that could’ve resulted in serious injury. Because of previous experiences, Wirsing dives by himself, eschewing the buddy system that is common in recreational diving. But as a trained commercial diver, he is safety savvy. He stays close to shore and dives in relatively shallow water. He has a dive compressor system with proper safety valves, an extra supply of air, dive computers, and certified diving hoses. His boat is in good working order and he pays attention to the forecast. Only once has he had to spend the night at Catalina because of weather conditions. When Brandi Cumin stood on the roof of a burning two-story house, flames dancing around her boots, there was just one thought that crossed her mind: at least it’s not that far down. Cutting holes in the roof for ventilation, fighting a fire that had already exhausted one crew, Cumin realized how close she was to potentially falling through the very surface she was standing on. Luckily for Cumin, who has been with the Torrance Fire Department (FD) for 15 years as both a fire engineer and on the hazardous materials team, she made it safely down from the roof. And that’s no surprise. “Yes, there’s risk to our job, but we’re well trained,” says Cumin. 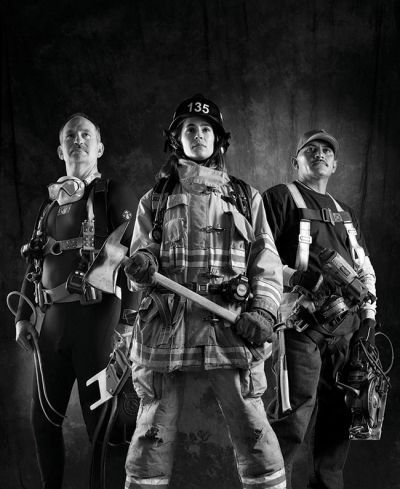 Training, equipment and safety precautions make firefighter fatalities relatively rare, but injuries are not. In 2011, there were over 70,000 injuries occurring among firefighters, according to the National Fire Protection Association. “I’ve treated firefighters for all sorts of injuries,” says Dr. Baker. Acute smoke inhalation can cause tissue damage, swelling in the lungs, and pulmonary edema. Firefighters can suffer from burns and carbon monoxide inhalation but are also at risk of falling and having things fall on them. The South Bay provides its own set of challenges. “Here in Torrance we have a unique blend of almost every situational hazard a firefighter might encounter,” says Steve Deuel, a Fire Captain with the Torrance FD. The ocean, manufacturing facilities, a large refinery and an airport all nearby, so the fire department “has found that we need to be really good at everything we do,” says Deuel. One of those things is hazardous materials response. Cumin has been on the hazmat team for five years, often responding to calls for toxic chemical exposures. “The crude refining process is a huge risk. One of the chemicals they use, hydrogen fluoride, eats at the bone if you touch it,” she notes. For the teams responding to manufacturing exposures, wearing proper equipment and testing the atmosphere for inhalation risks is critical to preventing injuries. Exposure to harmful chemicals doesn’t just happen working on the hazmat team, however. “One of the big risks is after the fire is out. The products of combustion (the gases) are the worst,” says Cumin, who stresses the importance of wearing a breathing apparatus even after the flames subside. Both Cumin and Deuel note the potential for long-term health problems from exposures to toxins. Perhaps the most common problem, however, is musculoskeletal. Lugging around 250-pound ladders and lifting and moving people out of buildings is not easy on the body, notes Cumin. The physical demands can result in back problems, strains, and serious injuries. “We can protect our lungs by wearing air masks and we can protect ourselves from thermal injuries by wearing all of our personal protective equipment. But we still ask our bodies to lift and contort in ways that sometimes seem impossible. 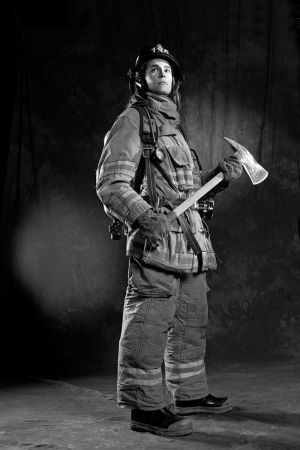 It can be heart wrenching to see a young firefighter in their 30s become hurt with a career ending injury when they are just doing their best in a bad situation,” says Deuel. And then there is the risk that we all face: traffic accidents. “Clearly you are taking a risk when you are driving and weaving in and out of traffic,” say Cumin, who as the fire engineer, is the one behind the wheel during the rush to an emergency. In fact, vehicle collisions were the second leading cause of fatal injuries among firefighters in 2012, according to the U.S. Fire Administration. It’s not hard to imagine why roofing consistently ranks as one of the most dangerous professions in construction—steeply-pitched roofs, slick surfaces, and a repetitive, physically demanding job that requires constant attention to ones’ surroundings. 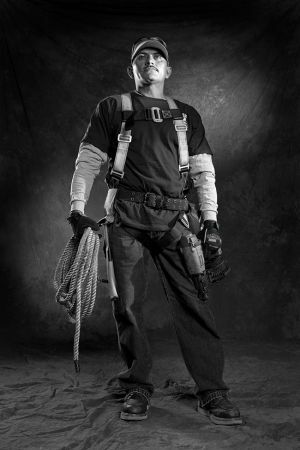 According to 2011 data from the Occupational Safety and Health Administration (OSHA), over 17 percent of all worker fatalities nationwide were in the construction industry; of these fatalities, the majority were due to falls. “Very often, it is an inadvertent tug on a cord, a blind turn by someone with material in their hands, or improper placement of materials which causes your fellow installer to bump, trip, or fall,” says Trevor Leeds, president of San Pedro-based Chandler’s Roofing. Falls can be a catastrophic injury, he says, but they are usually preventable. “Every crew is provided with a proper ladder tie-off device to secure their ladder from slipping and falling, and every installer is equipped with an OSHA-approved fall arrest device that anchors them to the roof and prevents them from falling to the ground,” says Leeds. Weather is another factor that plays into potential hazards. Even though the Southern California sunshine provides comfortable working conditions for most of the year, crews do sometimes work in wet and windy conditions. On these days, non-complacency and attention to detail are critical. “Unsecured roofing material combined with wet weather can also be catastrophic. Plywood not properly secured can turn into a surfboard very quickly on a sloped structure,” says Leeds. Roofing materials can be a crucial factor in determining risk to employees. When they used to do a lot of “hot mop” work—essentially applying molten asphalt tar on a roof—burns were a regular risk of the job. Dr. Baker has also seen the effects of this work. One roofer came to the ER with black tar burns on both hands and forearms; it looked as if “he was wearing black gloves,” remembers Dr. Baker. The roofer was seen at Torrance Memorial’s Burn Center, where he received skin grafts because of the seriousness of his injury.  Fortunately, advancements in roofing materials have allowed roofing companies like Chandler’s Roofing to phase out of this line of work, though they still use open flame torches. Though falls may rank high in terms of seriousness, other safety concerns are more prosaic. Like firefighting, Leeds notes that driver’s safety may be the single largest liability they have, as his crews are on the road daily driving to and from work sites. That means no texting while driving and seatbelts are a must. Back injuries are common to a profession that involves lifting heavy objects and bending over, while cuts from blades, nails, saws, and sharp objects are a routine hazard. Regular safety trainings and constant attention to the basics remain key to preventing small cuts and large falls. Still, those who have been in the roofing business long enough have their stories. Leeds tells of an experienced roofer improperly tying off his ladder and breaking his back; another roofing tycoon fell through a tarp and died at a construction site at his home. Dr. Baker once treated a roofer who was using a nail gun without any eye protection. A nail bounced off the surface he was working on and went straight into his eye. “You could only see the end of the nail, it was all the way embedded into his eye,” says Dr. Baker. Stories like these may be rare, but they are reason enough never to take safety lightly. “If the roofer was wearing protective eye equipment, it wouldn’t have happened,” Dr. Baker says of the eye injury. Like with most work-related injuries, it’s about recognizing risk and taking measures to avoid injuries.